1 of 3 In a large bowl, stir together yogurt, vinegar, dill, sugar, salt and pepper. Set aside. 2 of 3 Heat wheat berries in a microwave-safe bowl for 2 minutes; stir and heat 1 more minute, until thawed. 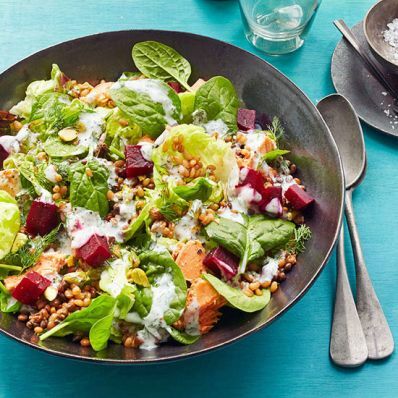 3 of 3 Toss wheat berries, lentils, beets, lettuce, spinach and pistachios in bowl with dressing. Gently fold in salmon, if desired.